WHAT IS IT? Rainbow nails in all shades of the rainbow but not in its order. I started painting my nails back when I was about 14 and loved it. Normal cosmetic brands back then only just started to have other colours than red and pink and maybe creamy beige. It took me a while back then to get all bright colours of the rainbow. 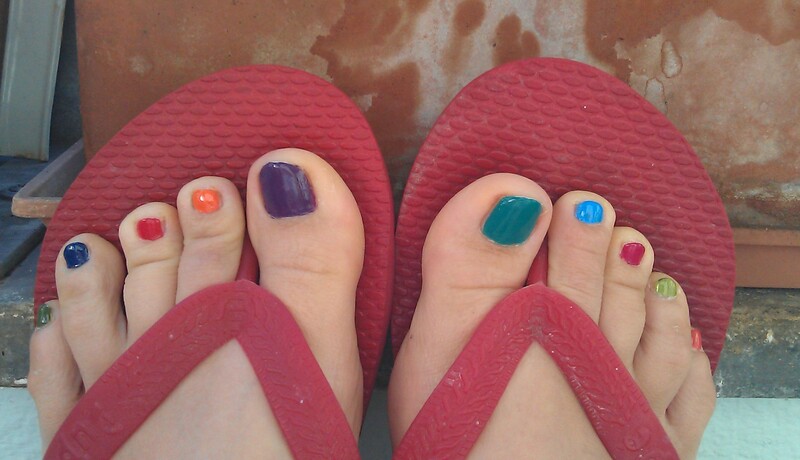 I think is a great way to do toe nails in summer and great to show of the amount of colours you have. WHAT IS USED? I used a bit of everything, going from left to right: Manhattan, Style proofed Blogger edition in an olive green shade (08S), my well loved pool side party edition from p2 in010 blue lagoon, an orange nail polish I bought especially for this (33S), red essence in 92 better late than never, p2 in 016 chic, a dark purple, dark turquoise from Maybellline, Colorshow in 120 urban turquoise, the second pool side party edition from p2 in 050 new wave in oh so bright light blue, pinky red p2 in 170 french kiss, bright acid green from essie (the more the merrier) from this year’s summer collection naughty nautical and orangy red chubby cheeks by essie. All were painted over the base coat All in one to avoid staining and topped with Good to go for shine and resistance, both by essie. HOW DOES IT FEEL? It feels great and a bit like back in school. I will keep this pedi for quite a while, I think! This entry was posted in Nail Art and tagged 31 day nail challenge, 33S, better late than never, blue lagoon, chic, chubby cheeks, essence, essie, french kiss, Manhattan, Maybelline, Nailpolish, new wave, P2, the more the merrier, urban turquoise by kathatravelling. Bookmark the permalink.